When practicing at home, I often listen to one of the many yoga playlists I’ve cultivated in recent years. My home practice flow is completely intuitive and leans toward the gentle. I don’t worry much about ideal sequencing. Rather, I just move from standing to seated, and to my belly or back, as often as allows me to explore the postures my body is asking for. I always begin with ample time for breath, and I conclude with restorative postures, such as legs in the air or a supine twist, before finally releasing into savasana. Given all of this, my ideal playlist begins and ends with calming instrumental music. For songs in the interim, I like to include music that feels appropriate for any posture, because I’m never sure where my practice will take me! No break-up songs or angry anthems make it onto my yoga playlists—I want music that encourages positive thinking and mood. Finally, I often weave in songs that reference the natural world to help me connect with the elements (fire, earth, air, water) as part of my practice. Does this sound like the kind of home practice—and the kind of music—that you enjoy too? If so, I invite you to check out the playlist below, which is one of my go-to home practice playlists. I call it “Positive Vibes Yoga Flow.” Read on for a quick description of each song. And you can also check it out on Spotify. I was introduced to Drucker’s music last year during a Kripalu retreat led by the amazing Joan Borysenko. Drucker’s music is unrelentingly positive and uplifting. Because I usually teach and practice gentle yoga, I love “Gentle with Myself.” It’s a wonderful reminder to slow down and take care of ourselves. Drucker is a prolific musician, so you’ll want to spend some time checking out her other albums. I love this song because it represents fresh starts and new beginnings. Jones’ voice flows like asana—sweet and steady. And channeling the sunrise while warming the body at the start of my practice is an ideal combination. If I’m making a playlist, chances are that Bob Marley will be on it. For me, the sounds of reggae music—with their upbeat vibes, cool vision, and call to relaxation—embody much of the spirit of yoga. Because the ocean has such a healing energy for me, I love this song’s lyrics and its message of loyalty and steadfast devotion. With intense drumbeats mixed with flowing vocals, this song is characterized by repetition that makes it perfect for a round of sun salutations. Include this in the middle of your playlist when you expect to be building a bit more heat. Enya is the true and original queen of New Age music. This is her most popular song, and it stands the test of time. It’s hypnotic, enlivening, and poetic. When listening to this classic, you’ll find yourself letting go of how you think your postures should look—instead embodying them from the inside out. You’ll remember this song from Madonna’s 1992 Erotica album. This acoustic version feels like it was made for a yoga practice. The beauty of the duet combines with powerful lyrics to remind us that the cycles of the natural world serve a higher purpose. I feel that I first truly discovered this song when I brought it into a class I taught during a full moon. I fell in love with it, and it now makes its way onto many of my playlists. I love the way Dennen uses the moon as metaphor for his relationship, and it often inspires me to add some moon salutations into my home practice. Just try not to sing along to this one—I dare you. We all love Cyndi Lauper’s original version, of course, but this remake is incredibly heartfelt and inspiring. I like to place this toward the end of my practice and just let the words wash over me. 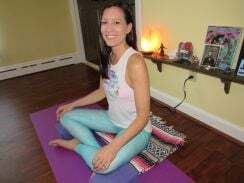 I listened to Jewel all the time in my teenage years and early twenties, but it was only when I began practicing yoga that I fully appreciated some of her lyrics. In “Hands,” she offers us a beautiful heart-opener: “If I could tell the world just one thing, it would be that we’re all okay.” This song is a moving reminder of the gift of taking responsibility for our lives, and the power we all have to make positive change. If you’re a yogi who hasn’t yet been turned on to Girish, it’s time to start listening. I remember the first time I heard this song—I immediately ran up to my teacher after class and asked for the artist’s name. In addition to his amazing music, Girish also recently released a book on chanting called Music and Mantras. Hearing him perform live is definitely on my bucket list. This combination of flute and singing bowls, tuned to the vibrations of the crown chakra, is a perfect way to end your home practice in savasana. You’ll feel connected to spirit as you restore yourself in your final resting pose.